Rita and Lo are sisters. They're traveling around with the circus their family belongs to. Dangerous acts and being the center of attention is what they're used to. They never stay anywhere long, they go from place to place. Lo and Rita have always been close, they tell each other everything, they have fun and they are best friends as well as siblings. However, something suddenly changes. Lo discovers a secret that makes her heart ache. She also meets a boy she likes, someone who isn't part of the circus, which means she has to leave him behind. Will Lo be able to cope with the abundance of emotions she can't talk to anyone about? Flight of a Starling is a beautiful heartbreaking story. I shed quite a few tears while reading it. It's clear from the beginning that something devastating is going to happen, but the question is what and how. The inevitability of it feels awful, but that's also what makes this book incredibly good. I knew it would end in an unfortunate way, but kept wishing the story wouldn't take that direction after all. There's so much tragedy and unfairness, something that moved me and made me angry. I love it when I feel so strongly about a story. Lisa Heathfield is a skilled storyteller. She gives her readers the chance to get really close to her main characters. Lo and Rita are such special wonderful girls and my heart ached for everything they lost in a short amount of time. 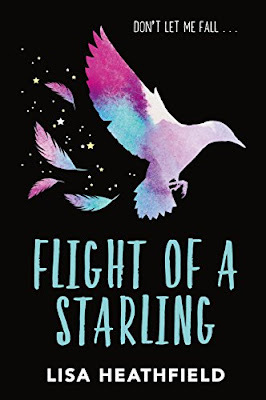 Flight of a Starling is a story about growing up, losing your innocence, finding out that life can be incredibly cruel, consequences and terrible mistakes. It's a story that unravels, something I wished I could undo. It greatly impressed me, I was surprised, captivated, daunted, emotional and stunned. I'm certain this is a book that will stay with me for a very long time. Thank you for the review, sounds good. But, but... I don't want to feel sad. I just looooove the cover! What a pretty cover!! I love the colors! I join all the ladies here by saying that the cover is amazing...the story seems a bit sad, I've always had mixed feelings for people working in circus: they visit a lot of places and meet tons of people, but they have to move eventually...sometimes can be a lonely way of living. I like a strong character driven story. And I like to read about sisters. Sounds like a good fit for me. And what a lovely cover. It sounds like a book that really takes chances, instead of opting for the safe path! OMG, yes! This is going on my Wish List. Aha! I might have known there were sisters involved! There's a lot of powerful emotions going on here within the close-knit circus family. I'm worried (& intrigued) about that "devastating something." I think it would be a very emotional read for me too.